Do you cough when the weather gets cold or at night? Do you have more trouble with exercise during the winter months? Do colds hit you hard and seem to linger forever? If so, your asthma may not be as well controlled as you think. Asthma often gets worse in the wintertime, but there are some simple things you can do to take control of it. Before we talk about owning your asthma, there are two things you need to know about: inflammation and muscle spasm and how these conditions affect your lungs. Inflammation: Inflammation is similar to having a burn on your skin—things get red, irritated, and super-sensitive. In your lungs, inflammation causes cough and chest tightness. 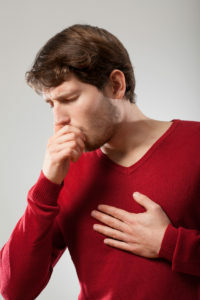 Just like when you have a burn on your skin and the lightest touch is painful, when your lungs are inflamed any exposure to irritating things such as smoke, dust, or cold air can make things worse and set off a bout of coughing and/or chest tightness. Muscle spasm: When the lungs become irritated, it causes the muscles around the lung tubes to spasm. This makes the tubes smaller and causes chest tightness and trouble breathing. This is where medicines such as albuterol come in—if you take it right and breathe the medicine all the way into your lungs, it will relax the muscles for a few hours. Ok, now that you’re armed with that knowledge, here are some helpful tips. Unless your asthma is very mild, most people benefit from using a medicine to cool down the inflammation in the lungs. These come in inhalers (Flovent, Advair, Pulmicort, Qvar, for example) or pills (montelukast or Singulair). If you take one of these medicines every day for a few weeks, you might find that you can breathe in cold air or exercise without needing your albuterol inhaler anymore. One thing to remember: these medicines work slowly, so it’s important to take them every day, even if you’re not having asthma symptoms. Triggers are things that irritate your lungs. Some things, like cold weather, you can’t control. Other things you can. If you smoke, talk to your health care provider about ways to quit. If your asthma is worse when you are lying in your bed, using a special mattress cover that effectively blocks allergens might help. Talking with your health care provider can help you identify triggers and come up with strategies to avoid them. Tip #4: Get a flu shot! When people with asthma get the flu, it’s a double-whammy on their lungs. The flu shot will definitely decrease your risk of getting the flu this year, so why not get the shot and spare yourself the misery of having the flu.